Vineyard Style Magazine: Home Portrait Perched in Paradise. From Dinosaur Bones to Deep Space, Home is Where the Heart Is. From Dinosaur Bones to Deep Space, Home is Where the Heart Is. Dr. Henry and Joan Kriegstein bought a summer home on Martha’s Vineyard in 1989, not because they knew people or even much in particular about the Island, but through a thoughtful process of elimination. They decided a summer getaway would help them and their two daughters, three and six at the time, get the most out of what they wanted to be a leisurely family break. The location needed to be removed enough from their regular life on the South Shore of Boston, but within easy commuting distance for Henry’s ophthalmology practice. The Berkshires and Nantucket had to be ruled out, but Martha’s Vineyard met both needs perfectly. Totheir delight, they found the Island a rejuvenating haven and a fun place with plenty of interesting activities for their girls. As the years passed, they became involved with the Island community, stretching their summers from spring to fall and even weekends in the winter. Joan was a board member for the Vineyard Playhouse, and is presently on the advisory council for the MV Film Society. She also gleans for Island Grown Initiative, helping to reduce crop waste by gleaning the extra produce from gardens and distributing the food to over twenty island organizations for those in need. In 1994 they bought their present house on Lagoon Pond and hired Mark Hutker, FAIA, principal and founder of Hutker Architects, to design the addition and renovation. He was given three items to address: a proper setting for their 66 million year old, seven-and-a-half-foot long, triceratops skull; a room with easy access outside for their deep space telescope, which one has to stand on a ladder to look down into in order to see up at the stars; and last but not least, a dog elevator for one of their aging dogs who had difficulty with stairs. Those three items tell a fascinating story about the family. From their interest in bringing to light the ancient history buried beneath the ground of our planet, to a desire to see far into the space outside our solar system, all the while caring about the health and comfort of their canine family members. How fitting, as well, that Henry is an eye surgeon and Joan a registered dietitian, former professional cook and public health nutritionist for the state of Massachusetts. Boyhood visits to the American Museum of Natural History in NYC began Henry’s interest in paleontology. For the past thirty years he has been organizing yearly private digs out to the wilds of Montana, the Dakotas, and Wyoming to search for dinosaur bones. Joan is not so keen on roughing it, but their daughter Adie, a real estate agent for the past decade in NYC, caught the bug at the age of thirteen and has joined her father on the week-long adventures ever since. The Kriegstein’s younger daughter, Sami, a film producer and founder of the Los Angeles Music Video Festival, did not catch the fossil obsession to her sister’s degree, but did comment that when she was in fifth grade, her class took a field trip to her house on the South Shore to look at the various dinosaur skeletons on display. It seemed only natural that the Kriegsteins would continue in that tradition and want to accommodate the ancient triceratops skull in their new home. Their architect turned the existing non-descript contemporary house into a beautiful shingle style with a bold curved wall at the front entry. On the interior, the curved wall contains an elegant, spiral stairway that winds its way around the massive dinosaur skull. The steps are shallow for their dogs, but also make for a slow, comfortable climb in which to view all sides of the prehistoric sculpture. In early March of last year, the front of the unoccupied house went up in flames when bags of sawdust and other materials from floors being refinished combusted on the front porch. Oak Bluffs fire chief, John Rose, was on duty and heard about the ancient triceratops head located in the front entry. Although the entire house was smoke damaged, and the front had to be rebuilt, the fossil was saved. “The firemen did a fabulous job,” said Henry with palpable gratitude. Tom Burke was the contractor for the original renovation project eleven years ago and Joan and Henry turned to him for help after the fire.Tom was wonderful shepherding us,” said Joan. “I don’t know what we would have done without him,” added Henry. When I sat out on the back deck, overlooking Lagoon Pond and the Vineyard Haven Harbor beyond, with Joan and Henry, they spoke highly of Tom and the rest of the crew. Henry smiled and nodded in agreement. I asked them what effect the fire had on their lives and the way they looked at their home. Joan answered in a quiet reflective tone. “There are things that happen in life that make you reevaluate who you are now and where you want to be going,” she said. They decided that when Henry retired they wanted to make the Vineyard their year-round home. They’d originally renovated the house with cool tones for a light, breezy summerhouse. Now, they wanted to adjust the feel of the place, use a warmer palette of colors throughout to be cozy in the colder months. It was the perfect opportunity to redesign the kitchen to better accommodate Joan’s joy in cooking, as well as remove the false beams in the living room ceiling in order to accommodate the suspension of a sixty-seven million year old Mosasaur skeleton–an aquatic lizard Adie discovered in Wyoming five years ago, and named Ceci in honor of her grandmother. The Kriegsteins figured the dog lift, which Tom went to great length to make workable, could be modified to a humanlift, or at the very least be used to bring groceries up to the kitchen on the second floor. They’d also fallen in love with the Arts and Crafts style after spending the past six Aprils in Carmel, California, and decided to incorporate the distinct, nature-oriented look into all aspects of the house. Tom was impressed by Joan and Henry’s special attention to every detail. From light fixtures and dishes, to furniture and door hardware, even a font Henry found for labeling the dog lift and half bath, or loo—all in homage to the Arts and Crafts style. Tom’s finish carpenter, Mark Sauer, created the living room fireplace surround and mantle from a photograph Joan showed him. She was delighted with his fine craftsmanship, his eye for correct proportion and detail just from a picture. Tom noted that Mark created all the period built-ins as well, and completed them on time. Joan and Henry chose Paul Lazes, owner of Rock Pond Studios, to design the kitchen specifically because of his interest in incorporating the skills of Island artists and designers. Paul suggested Lorraine Parish’s toile fabric with a simple tree design, a lovely line drawing of a famous old oak tree on the island, be made into tiles for the kitchen backsplash. The Kriegsteins then bought yards of Lorraine’s “Historic Tree” fabric for dining room chairs and living room pillow covers. On the walls of the open floor plan are numerous paintings by early California pleine air artists of various trees—eucalyptus, Monterey pine, and sycamore—that Joan and Henry collected during their visits to Carmel, a place famous for its love of trees. A chandelier over the dining table continues the tree theme with an ironwork design of branches. The Kriegsteins managed to seamlessly tie together their love of Martha’s Vineyard, Carmel, and the Arts and Crafts style through the simple images of trees. 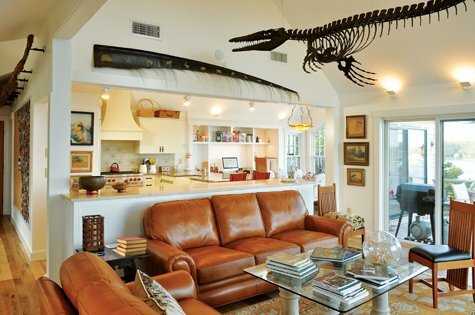 The same is true for their appreciation of dinosaurs and fossils, for these are not only incorporated into their home as astounding sculptures, the one hanging from the living room ceiling being particularly elegant, but also in the entry floor of fossilized tiles and the kitchen counter of Jurassic limestone. This house is all of a piece, a true expression of its inhabitants. It starts at the entry of double screen doors with cutouts of a Labrador retriever in each bottom panel that put a smile on your face. Then, the dark, heavy, fossilized dinosaur skull offers a sobering stillness. Next, the gentle, curving, upward movement of the stairs, passing whale vertebrae on the way, takes you to the upside down layout of the second floor. And it’s there, at the top of the stairs, on the opposite wall backed by the kitchen, where a huge corkboard, roughly eight feet wide by five feet high and pinned with hundreds of four by six inch family photographs from the past twenty-six years, greets you. A testament to their family history on the Vineyard. The open, honest candor is both humbling and inspiring. What’s more, those hundreds of photographs survived the fire. They were covered with plastic to protect them from the floor refinishing. The heat of the fire melted the plastic to the photos, effectively sealing them off from damage. Once everything cooled, the plastic came right off, leaving the photos intact. I was struck by how personal the beauty of Joan and Henry’s home is. Even with the sharp teeth of ancient relics, there was a heartfelt thoughtfulness everywhere I looked. I asked them what their favorite room in the house was. “The deck,” they both said. “From sunsets and sunrises, to meteor showers and osprey, the view is calming, peaceful, and restorative,” said Joan. And they even have telescope parties. What more could you want? In many traditions, trees are considered the connectors between earth and sky. I like the notion of Joan and Henry’s tree fabric, tile, and paintings, and their Arts and Crafts style connecting the dinosaur bones and deep space. The Kriegsteins may have a wide view of life, but they don’t lose sight of the core connection of their family and home.